Ha. Fantasies and realities seldom match up. Today, a friend in an online group mentioned that she’d baked a cake. I’d been wanting to bake a cake for a few days now, but I hadn’t gotten around to it. My Mix Master isn’t used very much, so it was a bit out of reach. (Read: my short self can’t get it down without help.) But I kept thinking that it would be cool to have Norton help me make a cake. I mean, that’s the kind of thing that we’d do in my fantasies about being a stay at home mom. I pulled a dining room chair over to the kitchen counter and put Norton on it. Then I poured the cake mix powder in a large mixing bowl. 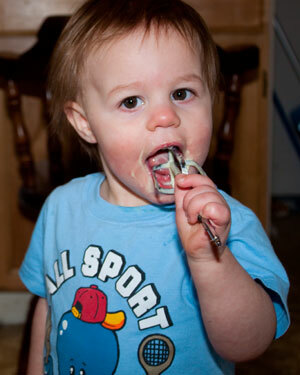 That’s when the fun began: Norton put his little hand in, grabbed a fistful of powder, and tried to eat it. I moved the bowl away while I grabbed eggs and heard him pull the bowl back to himself. Lather, rinse, and repeat while I gathered the rest of the ingredients. I tried to get him to help me with things like adding the water and the oil, but he wouldn’t have any of it. He also didn’t like the sound of the hand mixer, so I had to put him down for that. Of course, he still stayed in the kitchen with me and screamed at the noise. 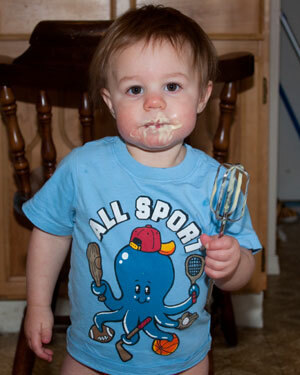 But once I was done with the mixer, that’s when the fun started: I let him lick a beater. And it was bliss. I didn’t think it was possible, but he managed to shove the whole end of the beater in his mouth. This stuff isn’t anything huge or profound, nor was it terribly messy. But this is definitely what being a stay at home mom is all about. I love this cute little story. You will have many fun baking memories to come!